In Puerto Rico, some residents are preparing to be without electricity for up to four months. In St. Thomas, part of the U.S. Virgin Islands, people are praying their roofs hold. Throughout these American territories and other Caribbean islands in Hurricane Irma's path, there was widespread fear Tuesday, even in the face of preemptive emergency declarations, that this ferocious and possibly historic Category 5 storm will mean a long, painstaking journey back to normalcy. Irma is predicted to become the strongest hurricane on record to hit the Leeward Islands, a band of territories and commonwealths stretching southeast from Puerto Rico. 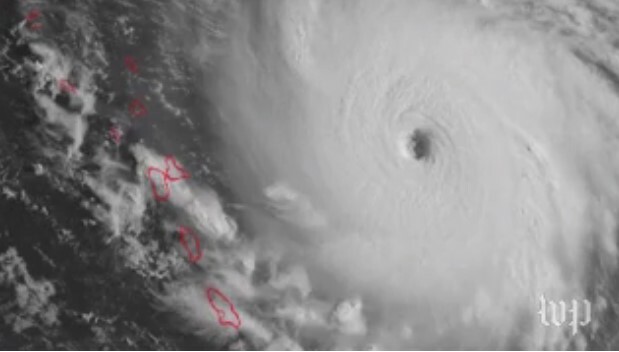 At 11 p.m. Tuesday, the National Hurricane Center declared it a “potentially catastrophic Category 5 hurricane” that was just off the northern Leewards. Hurricane warnings have been issued for Antigua, Puerto Rico, the U.S. and British Virgin Islands, as well as parts of the Dominican Republic. Irma's center could pass to the north of Puerto Rico and the U.S. Virgin Islands, leaving them less prone to the storm's most ferocious elements, but damaging winds, pounding rain and a large storm surge remain likely. Pujols, 26, spoke to The Washington Post on Tuesday night as she and her father, 55-year-old Edwin Pujols, raced to the airport to retrieve her mother, who was returning home from a trip to Pittsburgh ahead of the storm, having refused to let her family ride out Irma without her. The three will be holed up at home with Andrea Pujols’s grandmother and dog, Lady. In and around their city, which is not expected to see much flooding, they said, several churches have opened as shelters for those who have evacuated — and for those forced to do so later. To prepare, the Pujols family stocked up on canned food, water and fuel for their small generator. It provides enough power to run some lights and fans, which in the absence of air conditioning should offer mild reprieve from the wilting tropical air. They've even filled several large garbage cans, anticipating that water and sewer service will be disrupted “for who knows how long,” Edwin Pujols said. Local government officials have done well, they said, encouraging residents to prepare by stockpiling supplies, avoiding dangerous places or unnecessary risks, and leaving areas most prone to flooding. “But with rain over rain over rain,” Andrea Pujols added, “we're just hoping it doesn't get any worse” than what has been forecast. Farther east, municipalities throughout the U.S. Virgin Islands are bracing for destruction of the like its 107,000 residents have not experienced since Hurricane Marilyn in 1995 and, very possibly, Hurricane Hugo in 1989. Both storms — Marilyn hit St. Thomas as a strong Category 2, Hugo struck St. Croix as a Category 4 — claimed lives, leveled homes and business, and knocked out basic services for months. Del. Stacey Plaskett, who represents the territory in Congress, told The Post on Tuesday that the Federal Emergency Management Agency has people pre-staged there to help begin recovery efforts once the storm passes. The White House declared a state of emergency there earlier in the evening, but Plaskett, a Democrat, called Irma “a local issue” and insisted the local government has the lead in ensuring an orderly response. Of principal concern, she said, are the islands' hospitals, many of which have lacked enough federal funding to complete building upgrades that would strengthen them against severe weather. What money is given to the Virgin Islands through Medicare and Medicaid is prioritized for patient care, she said. The Navy is standing by, with a hospital ship and medical personnel, to provide evacuations and assistance if needed, Plaskett told The Post. Michael Resch, whose father built St. Thomas's Island Beachcomber Hotel in 1957, had moved all guests to the building's first floor and stowed any pool furniture that could become airborne in Irma's powerful winds. He is hopeful that reinforcements made to the hotel after Hurricane Hugo will keep the roof intact in his hotel's three buildings, and that any power loss will be brief. The Island Beachcomber doesn't have a generator, he said. 0 Response to "Hurricane Irma, The Strongest Hurricane to hit the Leeward Islands "